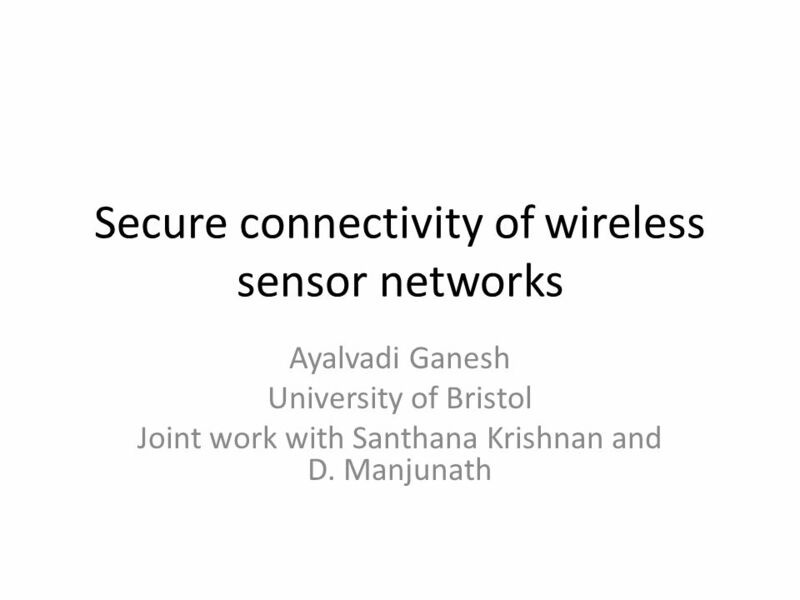 Secure connectivity of wireless sensor networks Ayalvadi Ganesh University of Bristol Joint work with Santhana Krishnan and D. Manjunath. 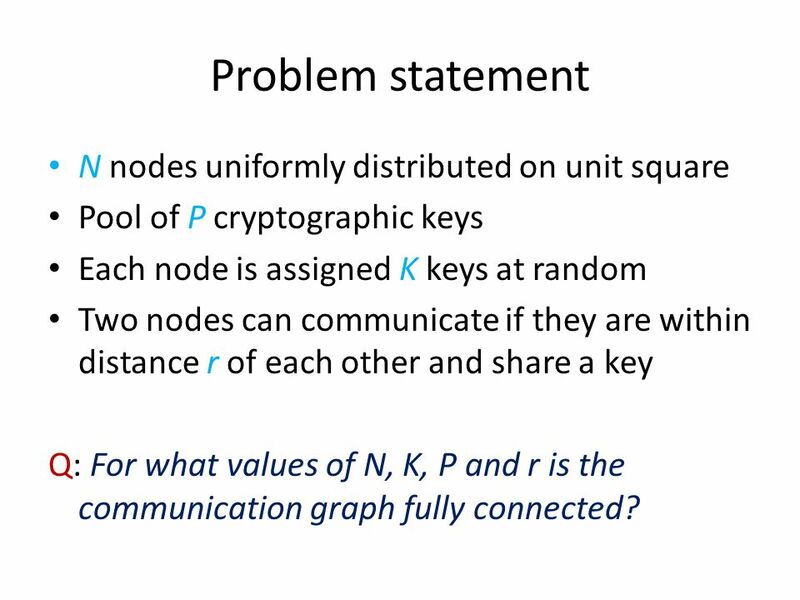 2 Problem statement N nodes uniformly distributed on unit square Pool of P cryptographic keys Each node is assigned K keys at random Two nodes can communicate if they are within distance r of each other and share a key Q: For what values of N, K, P and r is the communication graph fully connected? 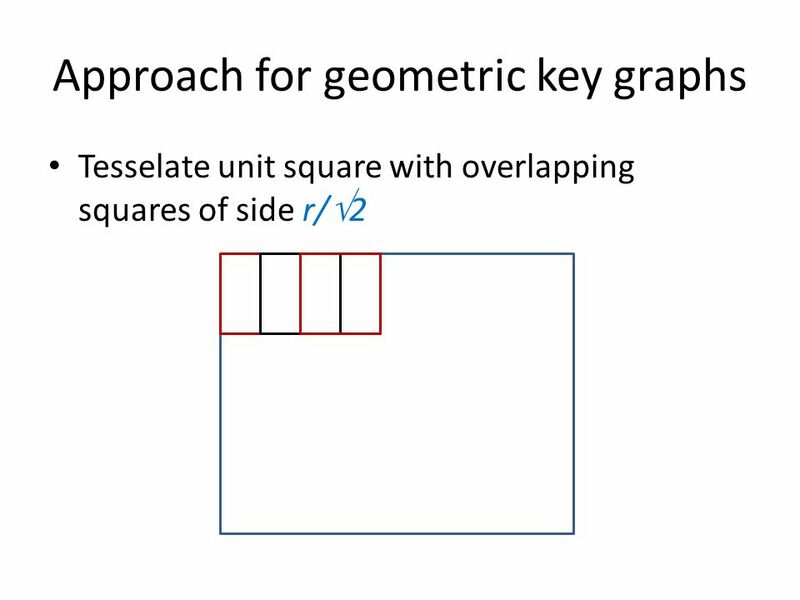 12 Approach for geometric key graphs Are there disconnected components of different sizes in the unit square? 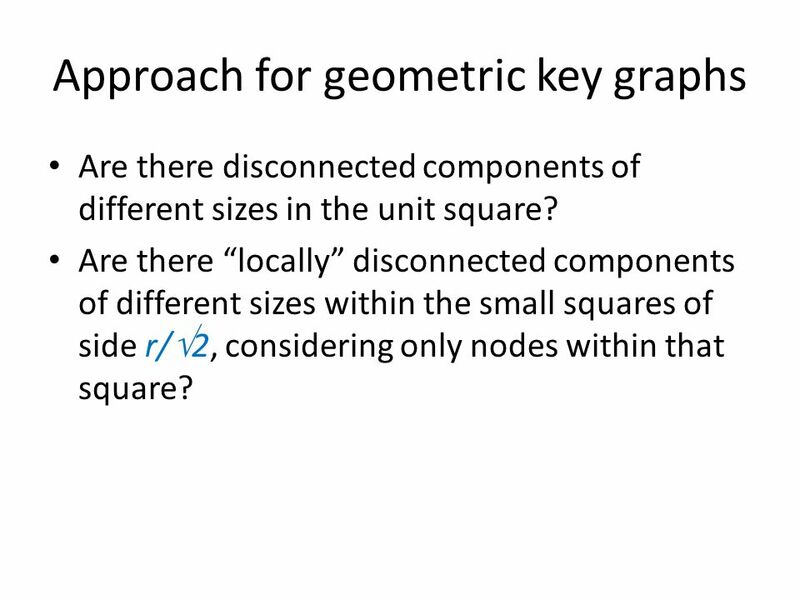 Are there “locally” disconnected components of different sizes within the small squares of side r/  2, considering only nodes within that square? 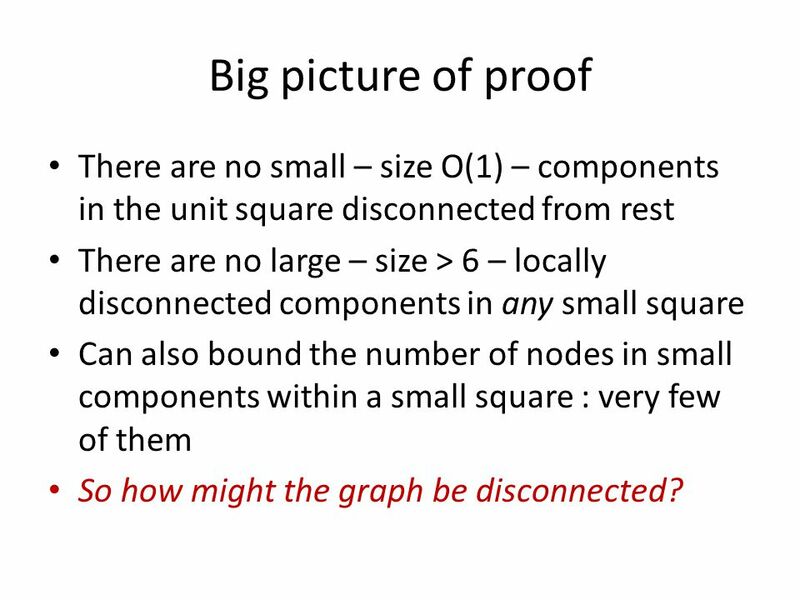 13 Big picture of proof There are no small – size O(1) – components in the unit square disconnected from rest There are no large – size > 6 – locally disconnected components in any small square Can also bound the number of nodes in small components within a small square : very few of them So how might the graph be disconnected? 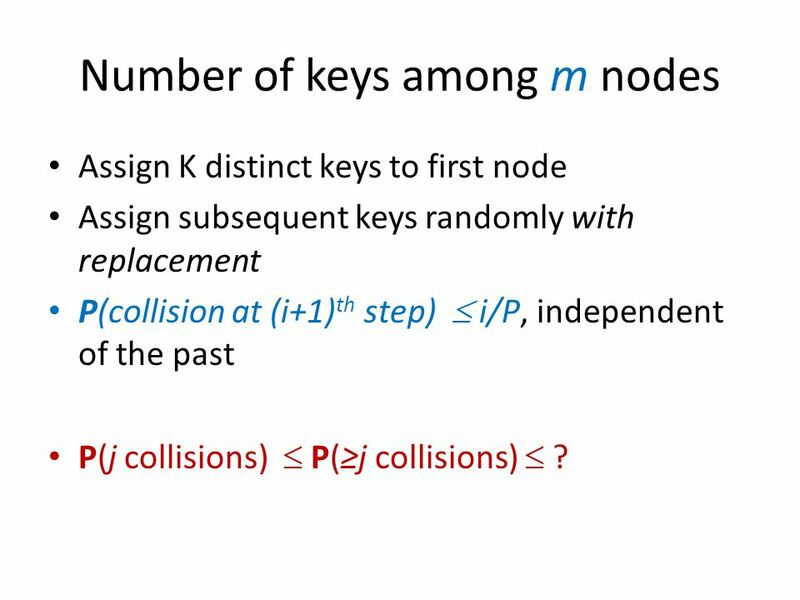 18 Number of keys among m nodes Assign K distinct keys to first node Assign subsequent keys randomly with replacement P(collision at (i+1) th step)  i/P, independent of the past P(j collisions)  P(≥j collisions)  ? 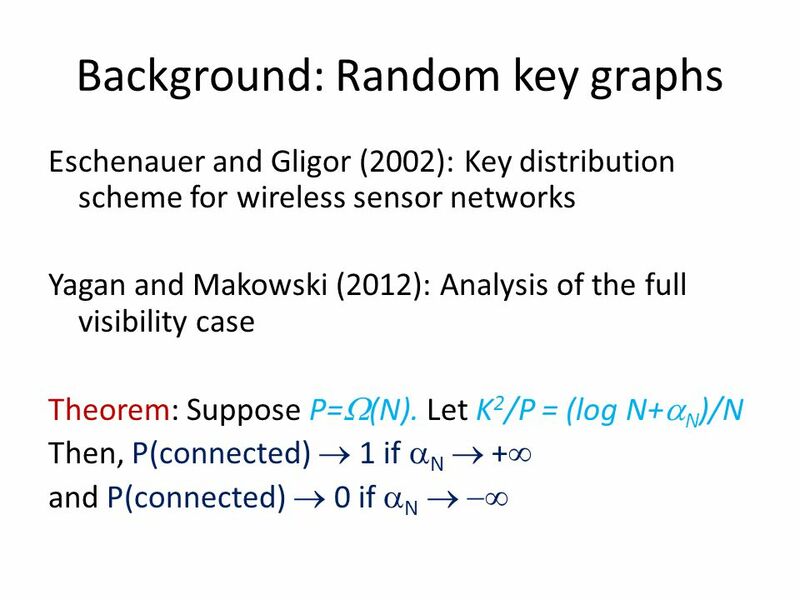 Download ppt "Secure connectivity of wireless sensor networks Ayalvadi Ganesh University of Bristol Joint work with Santhana Krishnan and D. Manjunath." 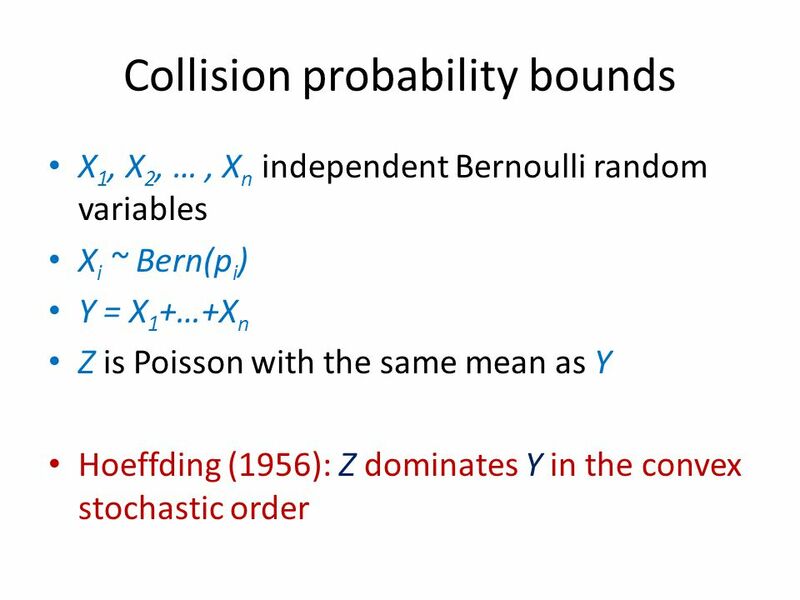 Quantum Lower Bound for the Collision Problem Scott Aaronson 1/10/2002 quant-ph/ I was born at the Big Bang. Cool! We have the same birthday. 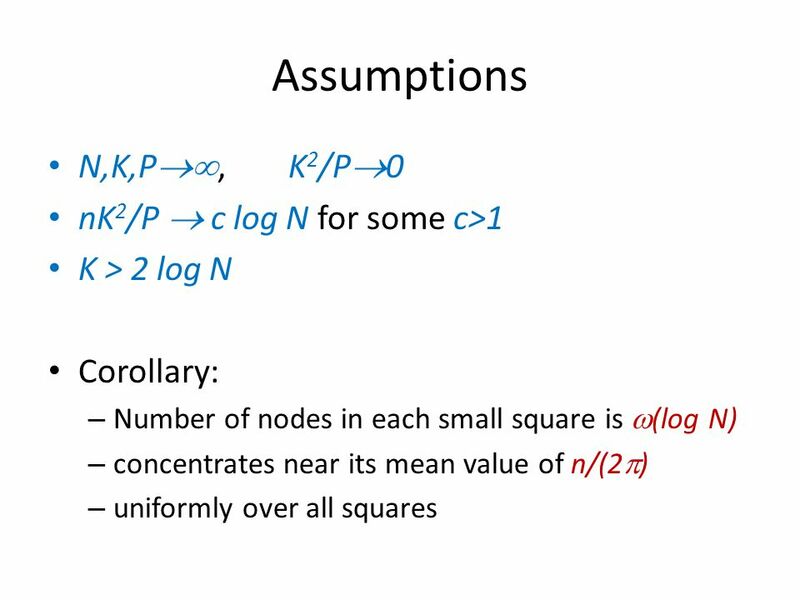 The Future (and Past) of Quantum Lower Bounds by Polynomials Scott Aaronson UC Berkeley. 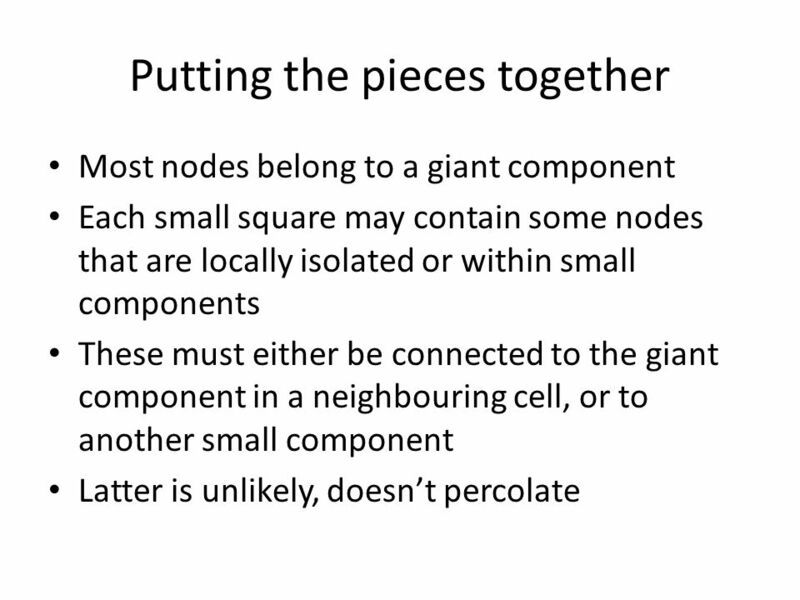 Routing in Poisson small-world networks A. J. Ganesh Microsoft Research, Cambridge Joint work with Moez Draief. Chapter 4 Partition I. Covering and Dominating. 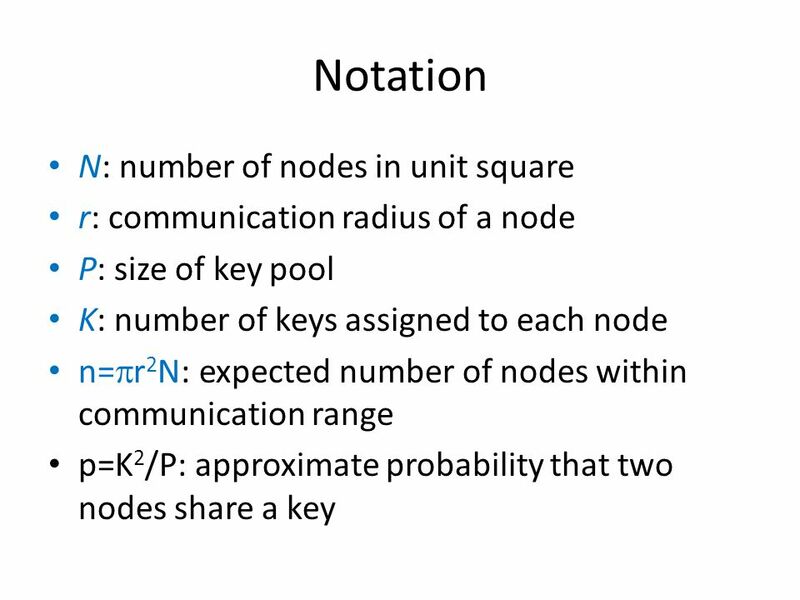 B ETTI NUMBERS OF RANDOM SIMPLICIAL COMPLEXES MATTHEW KAHLE & ELIZABETH MECKE Presented by Ariel Szapiro. 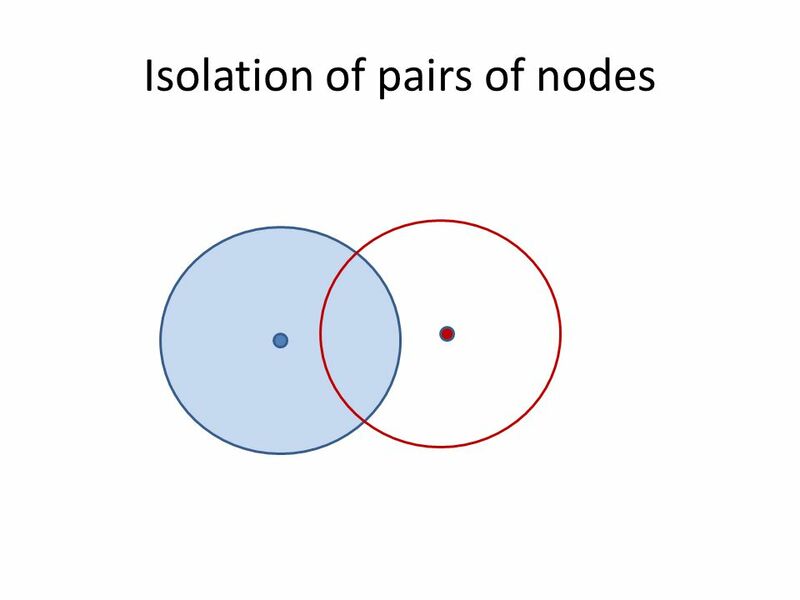 Complex Networks Advanced Computer Networks: Part1. The Capacity of Wireless Networks Danss Course, Sunday, 23/11/03. 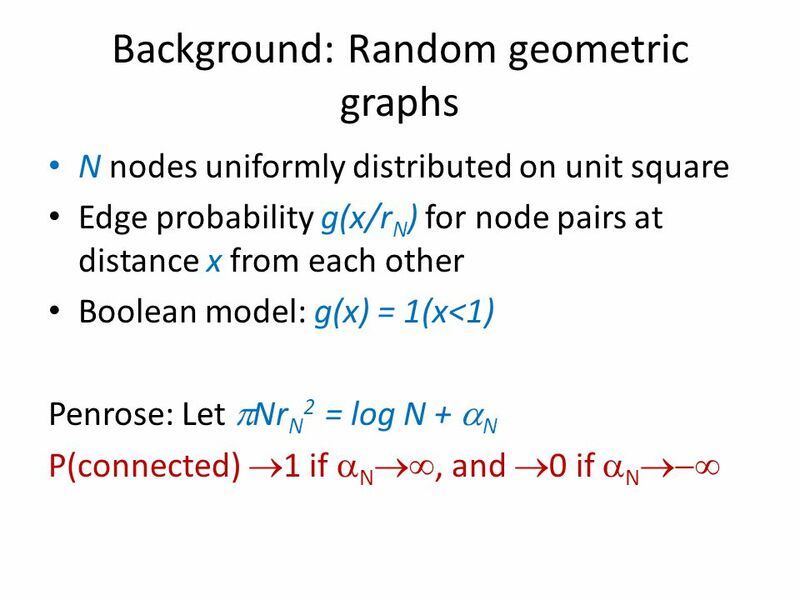 The Theory of Zeta Graphs with an Application to Random Networks Christopher Ré Stanford. Occupancy Problems m balls being randomly assigned to one of n bins. (Independently and uniformly) The questions: - what is the maximum number of balls. 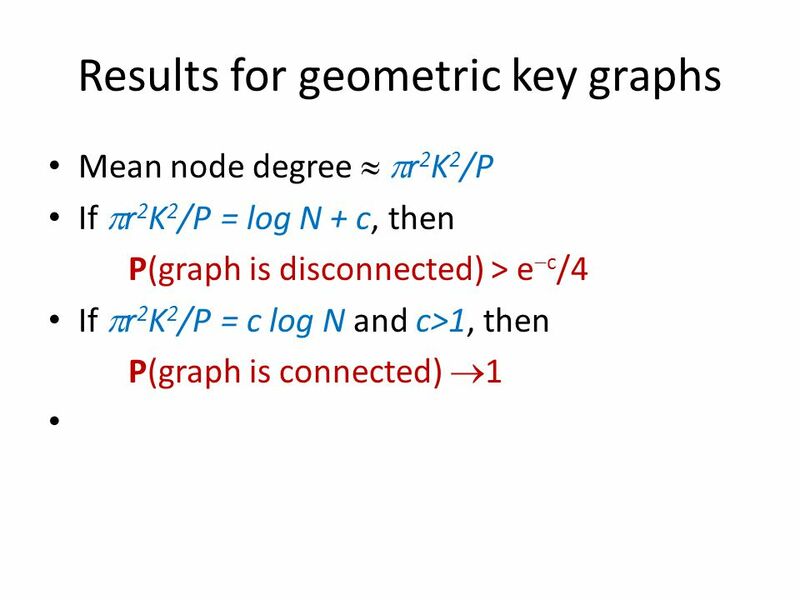 Algorithmic and Economic Aspects of Networks Nicole Immorlica. 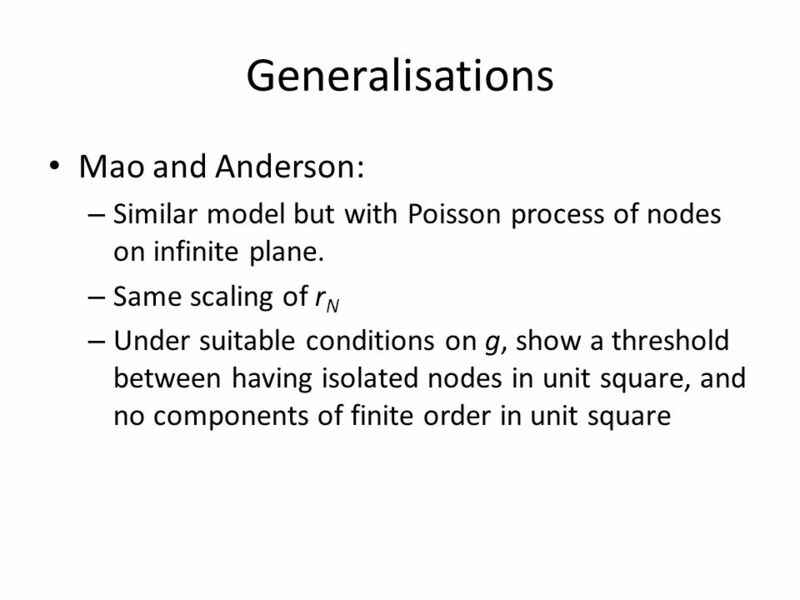 ENGG 2040C: Probability Models and Applications Andrej Bogdanov Spring Limit theorems. 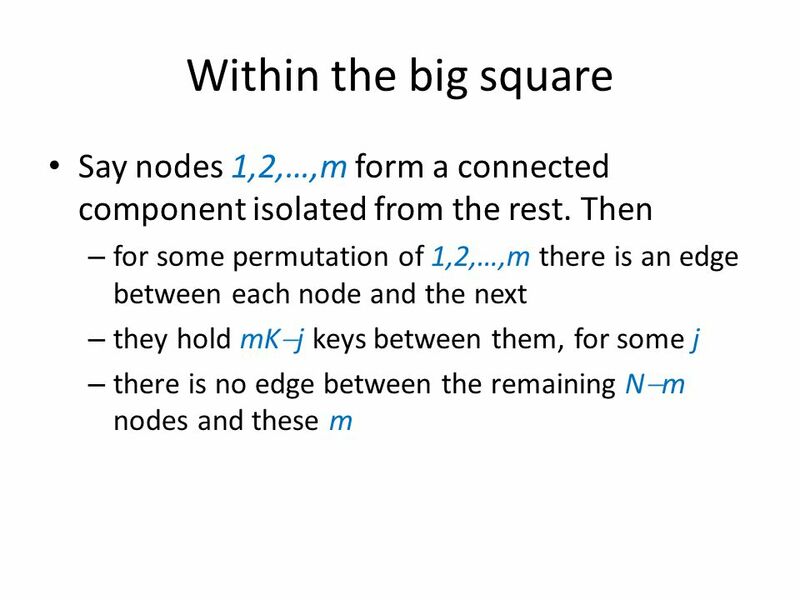 A Mathematical Formalism for Agent- Based Modeling 22 nd Mini-Conference on Discrete Mathematics and Algorithms Clemson University October 11, 2007 Reinhard. 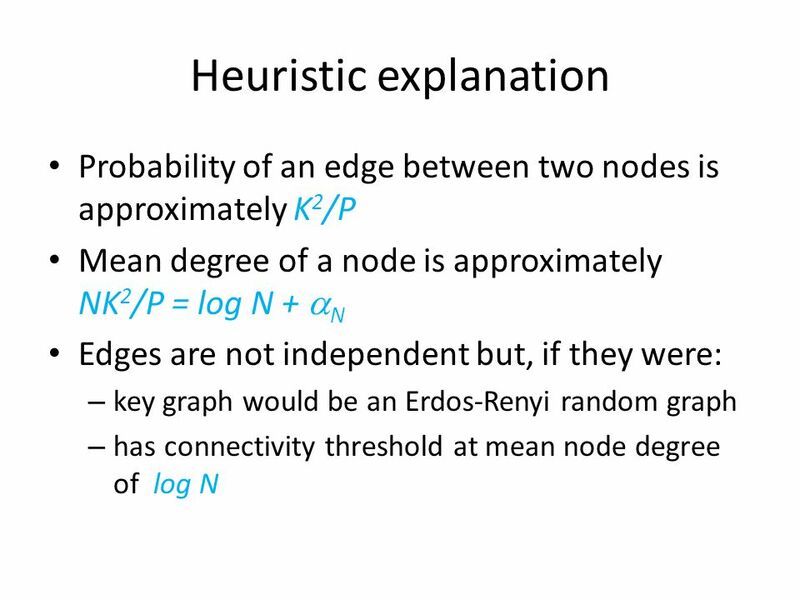 Bayesian Networks, Winter Yoav Haimovitch & Ariel Raviv 1. 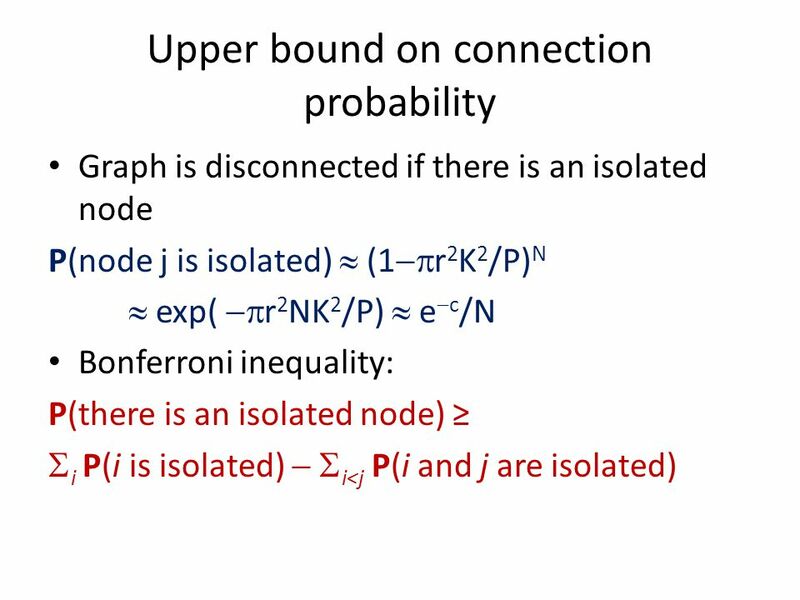 Approximation, Chance and Networks Lecture Notes BISS 2005, Bertinoro March Alessandro Panconesi University La Sapienza of Rome. Theoretical Analysis. Objective Our algorithm use some kind of hashing technique, called random projection. 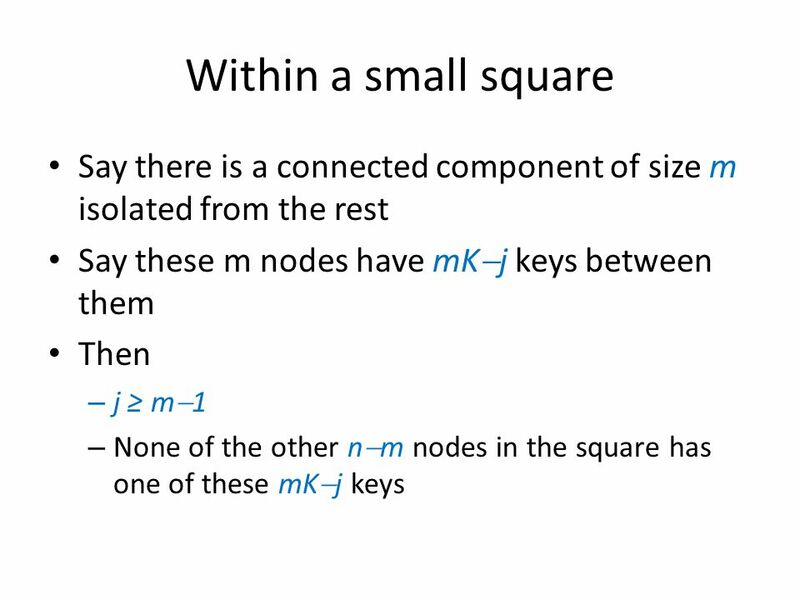 In this slide, we will show that if a user. 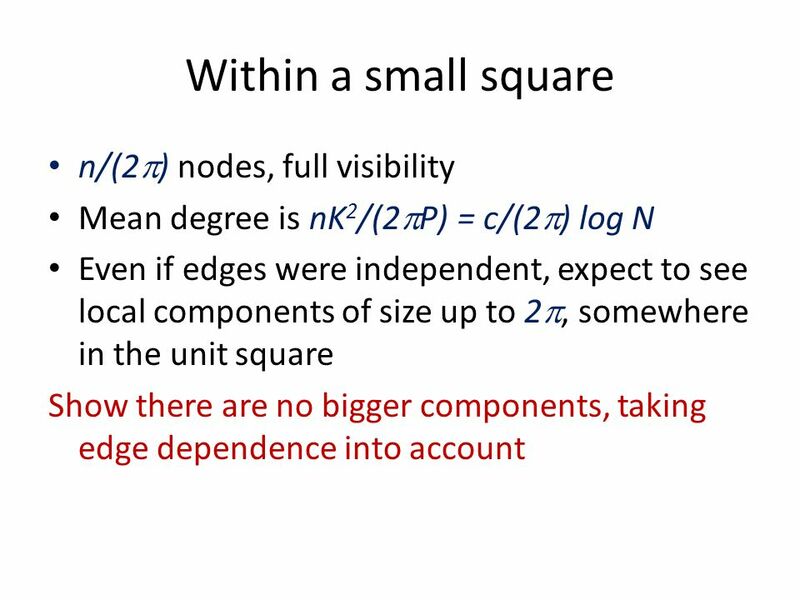 Week 5 - Models of Complex Networks I Dr. Anthony Bonato Ryerson University AM8002 Fall 2014. 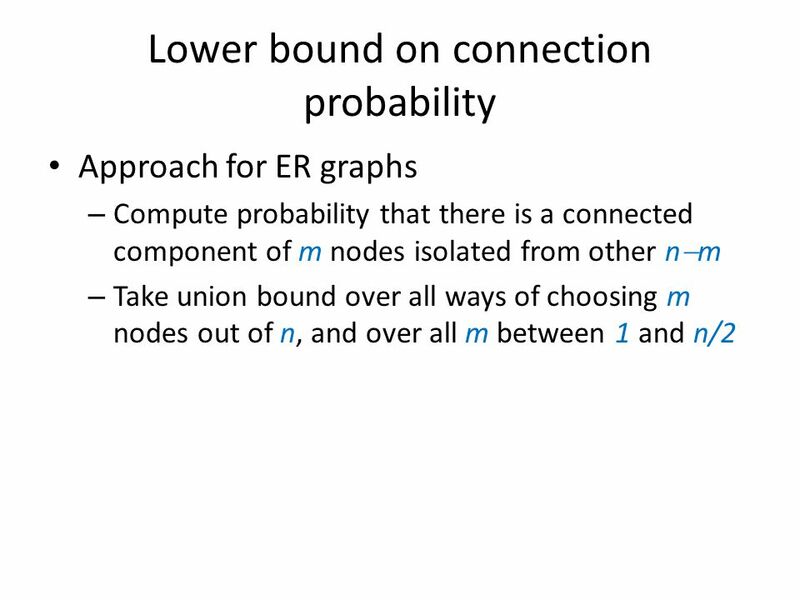 Week 4 – Random Graphs Dr. Anthony Bonato Ryerson University AM8002 Fall 2014.